The dress has very thin straps and a ribbon band on the empire waist. 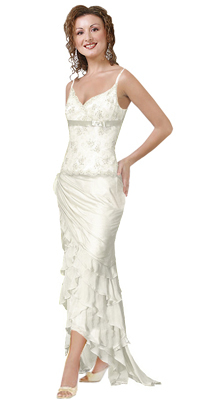 The bodice has an overlay of lace that can be seen on the neckline clearly. The skirt is asymmetrical and it has multiple frilled layers. The back neck is round in shape and is deep, a perfect chance to flaunt your back.